Laurie and I have been here in India for the last two weeks. First with friends in Mumbai, where we led a weekend Zen retreat, teaching from Dogen and Suzuki Roshi in the heart of Maximum City. We commuted daily much the length of the city, from our hotel in Santa Cruz, near the airport, via the harpesque Sea Link Bridge to a makeshift retreat center by the shore in the south of the city. Along that drive the extremes of conspicuous wealth and squalid poverty alternate with a terrible social logic. It is an amazing and overwhelming city. I love its energy and abundance of better and worse…and we were ready to fly out to Nagpur. Nagpur, square in the geographic middle of India, is a sprawling and ragged city of 2.5 million. It is known as the “Orange City,” which I know only because there is a big orange sphere on a pedestal in the center of town. Much of the year it is unpleasantly hot. Fortunately for us, the late winter weather was mild, even cool. Nagpur is also a center for India’s Dalit Buddhist movement. That is what brought us there. For the last four years I have been visiting a remarkable school in Nagpur — Nagaloka or the Nagarjuna Training Institute (NTI) <http://www.nagaloka.org/>. Usually I teach there for a week and spend time with the students. Back in the states I do my best to raise money for direct support of these students and for their local projects after graduation. Since 2002 NTI has been operating a residential Buddhist activist training program for youth from a lovely 15-acre campus on the city’s outskirts. An extraordinary 40-foot tall image of a golden walking Buddha watches over the site. In the cool of an evening families come out from town after work to gather and pay their respects. Nagaloka was established by the Indian practice community, Triratna Buddha Mahasangha, what used to called FWBO, or Friends of the Western Buddhist Order, created by the British Buddhist teacher and scholar Sangharakshita. Indian order members have done remarkable work over the last thirty years, bringing dharma to the poorest of the poor. As always I owe thanks to Lokamitra, Mangesh Dahiwale, Vivekaratna, Nagamitra, Maitreyanth, and numerous others. 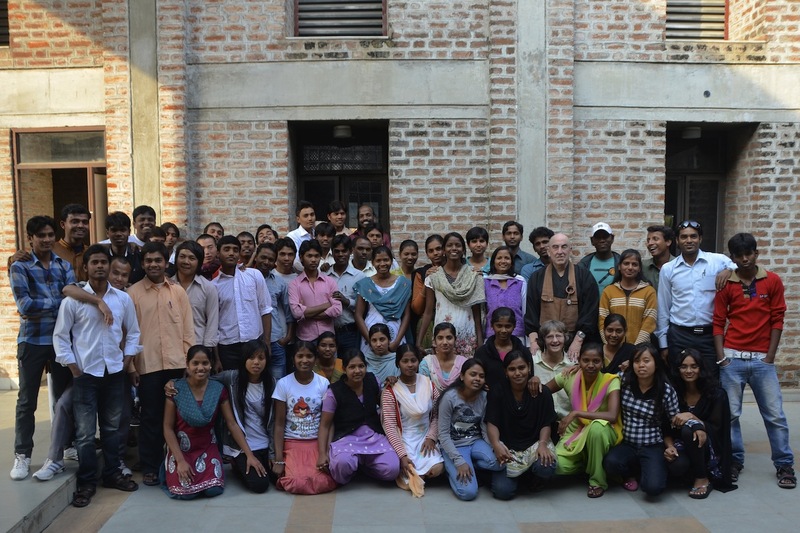 Over the last eleven years Nagaloka has hosted more than 700 young people from 24 states of India. The 8–month program includes meditation and chanting twice a day, education in the Buddha’s teaching, social thought, investigation, and action. At their heart of their vision is the example of Babasaheb Dr. B.R. Ambedkar, a key figure in the creation of modern Indian, little known in the west. Ambedkar was himself from an untouchable Mahar background. (Dalit, “meaning broken to pieces,” is a word adopted by Ambedkar for outcasts and untouchable groups and tribes totaling perhaps a majority of India’s population.) By virtue of his astonishing mind and great effort Ambedkar won an education for himself, one of the first untouchables to graduate from an Indian university. He went on to doctorates in economics from Columbia and from London School of Economics, as well as admission to the bar in Great Britain. He was a fierce advocate for Dalit/untouchable rights, and is the principle author and editor of the Indian constitution. The force and clarity of his writing is vivid and radical even today. Along with Ambedkar’s social thought, his experience of caste within a Hindu-dominated social and religious system led him to look deeply into religion. In 1935 he vowed that he had been born a Hindu, but would not die as one. By 1956 he completed his influential book The Buddha and His Dhamma and, along with 400,000 Dalit brothers and sisters formally converted to Buddhism at the Dikshabhumi (conversion grounds) in Nagpur. There is much more to say about the influence of Babasaheb Ambedkar. His social vision of Buddhism has been a guiding light for me over the last twenty years. And the young students at Nagaloka are in every spiritual and intellectual sense Ambedkar’s children. They all come from impoverished rural backgrounds, gaining an education against unimaginable barriers of caste discrimination, poverty, and even violence. This year we did a weeklong unit on parallels and differences between the Dalits and African-Americans, looking at the history of slavery, the U.S. civil rights movement of the 1950s and 60s, and considering how racism and discrimination remain imbedded in American society despite courageous advances. And how this work is yet to be done in India, despite is growing economic and technological development. Ambedkar’s vision and the vision of Shakyamuni Buddha remain in our mind’s eye, the vision of future India, a nation defined by “liberty, equality, and fraternity.” These are the principles Dr. Ambedkar saw as the essence of the Buddha’s social teaching. Laurie and I leave our heart with the students, who threw themselves into our study each day, who shared their vivid and painful life stories with us, and regularly posed questions that push at limits of our understanding. Half a world away from Berkeley, both of us feel completely at home at Nagaloka. We yearn for a day when Nagaloka’s students can share their vitality, understanding, and dharma throughout India and the suffering world. This entry was posted in Uncategorized and tagged Ambedkar, Dalit, Engaged Buddhism, Indian Buddhism, Nagaloka, Senauke. Bookmark the permalink.